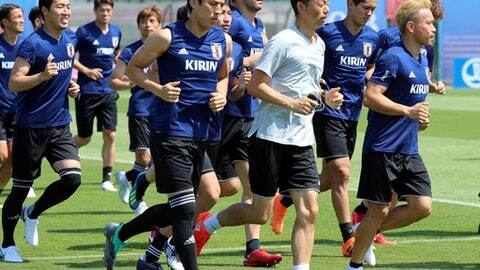 VOLGOGRAD, Russia (AP) Akira Nishino knows there are a few ways for his Japan squad to qualify for the knockout stage of the World Cup for the third time in five tournaments. But Nishino’s squad, which was the lowest-ranked and considered the longest shot to advance from the group, was emboldened by its opening 2-1 win over Colombia and now is aiming to advance with a bigger win over winless Poland, which is already out of contention. Colombia, which is on three points, could still top the group with a win over Senegal in Samara. If that can’t separate them, FIFA will draw lots to decide who goes through. Japan has been impressive in Russia, particularly during its 2-1 victory over Colombia when admittedly it was playing against 10 men for most of the match. It also showed resilience in coming back twice to secure a draw against Senegal, the second equalizer coming from Keisuke Honda, who became the first player in Japan’s World Cup history to score in three tournaments. Poland, by contrast, has been one of the competition’s disappointing teams, particularly in attack despite the presence of star striker Robert Lewandowski. Over its two defeats, Poland has only scored a single goal. Under-fire coach Adam Nawalka has taken responsibility for the team’s performances but has adamantly defended his players even after the 3-0 loss to Colombia, which confirmed Poland’s early departure from the competition. Japan should be aware of Poland’s recent World Cup history. On its two previous appearances at the World Cup – in 2002 and 2006 – Poland also lost its opening two games, but went onto to finish the tournaments on a bright note with victories over the United States and Costa Rica. Should Japan get through to the next round, it won’t know which team it will face in the round of 16 until later Thursday when Group G comes to a conclusion. Belgium takes on England, both of which have already qualified after their two group wins against Panama and Tunisia.